We've all heard the expression 'a picture is worth a thousand words.' There is something to that when it comes to Pittsburg Community Schools' English Speakers of Other Languages Program or ESOL. 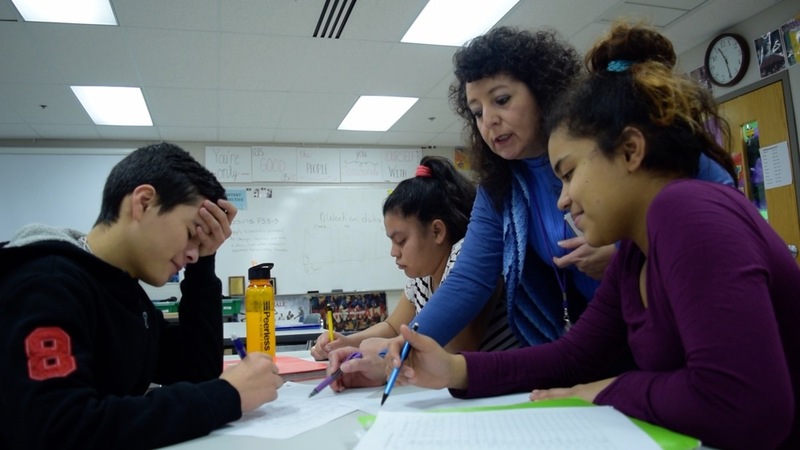 Currently, the District's ESOL program teaches students whose home languages are Arabic, Chinese, Marshallese, Spanish, and multiple dialects of the African language. Pictures are just one teaching strategy used in the ESOL program to remove barriers and empower students to own their future and their learning. "We use good teaching strategies which include pictures, pacing, building background to what we are talking about, and repetition," Monica LaForte, Migrant/ESOL Education Coordinator, said. LaForte says the program has averaged 200 to 300 students each school year for the past five years. Eighth-grader Daniela Martinez has been in the program since Kindergarten. She was born in the United States but her family is from Mexico and Spanish is her home language. She credits the ESOL program with helping her better understand what is being taught in the classroom. “It helps me with vocabulary, like in English Language Arts, it helps me a little bit more to understand what they’re talking about," she said. "If they are not able to communicate, they will not be able to be successful in the United States because they need the English language for everything," LaForte said. "For them to be able to have friends, socialize, perform well academically, they need to know the language. That’s what we do to help them succeed." Eighth-grader Dilan Calderon is from Guatemala and was in the ESOL program beginning in the second grade. He has since graduated and has gained more confidence in his education and future. "At first, since I didn’t know English, I couldn’t speak with other kids, so I didn’t have friends for a long time," Dilan said. "It was pretty sad but I got my confidence up and decided to listen to the teacher, which helped me a lot because that’s how I learned to speak English and eventually gained friends." Last semester he took a journalism class which required a lot of writing. To help fellow ESOL students, he would translate the newspaper for Spanish speakers. Calderon says the program has helped him not just in school but in life. He wants to be a dentist. "I want to be somebody in the future. To do that I must learn English. They [my parents] are happy for me because they didn’t have the opportunity to learn English and they just want me to learn it the best I can." "Through our whole society we deal with a world of multiple languages and being bilingual or trilingual will help you gain more opportunities," LaForte said. "The program helps students in this society better find a job, be open-minded, and be more valuable."